A MAN JUMPED inside a polar bear pit at the Copenhagen Zoo today, forcing zookeepers to fire rubber bullets at the 621-kilogram bear so they could rescue him. The man leaped into the enclosure shortly after noon as guests, including children, were watching the 10-year-old bear. Zoo staffers at first yelled to distract the animal from his potential prey before others with firearms arrived, firing rubber bullets to get the huge animal to back off. Once the bear returned to its cage, zoo employees entered the enclosure to rescue the intruder. “He walked up to the male bear of his own free will” but was able to get away with “only superficial wounds,” said park manager Steffen Straede, who was visibly upset at the incident. The man, reportedly in his twenties, was not identified and his motive for entering the enclosure was unclear. He was taken to a hospital for treatment. The zoo has no plans to make any changes to the enclosures following Wednesday’s incident, Straede added. In July 2012, Siberian tigers fatally mauled a 21-year-old Afghan-born man inside an enclosure at the same zoo. The Copenhagen Zoo also made international headlines last year when it killed a giraffe for inbreeding reasons, then dissected it and fed it to lions in front of visitors, including children. Read: Is this German zoo facing an animal serial killer? 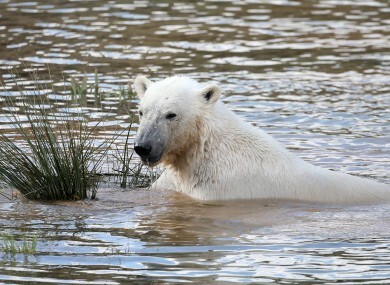 Email “Polar bear shot with rubber bullets to stop it attacking man who jumped into enclosure”. Feedback on “Polar bear shot with rubber bullets to stop it attacking man who jumped into enclosure”.